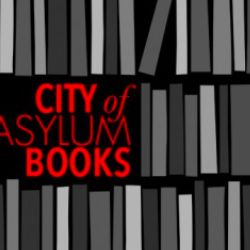 City of Asylum Pittsburgh‘s Jazz Poetry Concert is here! 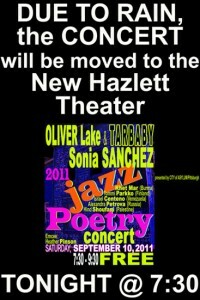 Today, 7:30 pm at the New Hazlett Theater. As I work on the final preparations for this year’s Jazz/Poetry concert, I am reminded of two things. The first is that this concert represents the best in people. 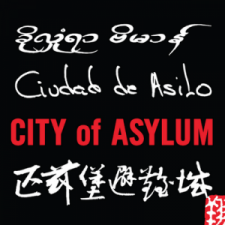 It is an amalgam of the arts and cultural idiosyncrasies, joined in the intent to make this world a better place. Through people and artistic expression, we temporarily forget the social injustices of the world, the lack of humanitarism, the lack of resources, political strife, and the economic plague fracturing our own country and, instead, focus on the belief that we can do better. I only hope that belief will continue from Saturday night on into Sunday, September 11. The second thing that dominates my mind are the drastic changes of events that can, and sometimes do, occur in one’s life. This time last year, I worked backstage for the same event instructing super famous musicians and poets on and off stage while picking up the trash and cleaning up after the show. The level of talent on stage was mind blowing, and I tried to act as cool as possible backstage with the performers. This year, I was asked to emcee the same event. From picking up the trash to picking up the pronunciation of names of travel-weary poets, I feel like an NPR correspondent reporting on world events that are happening literally in my backyard. These were the first words I spoke to a room full of the most talented musicians I have ever met. 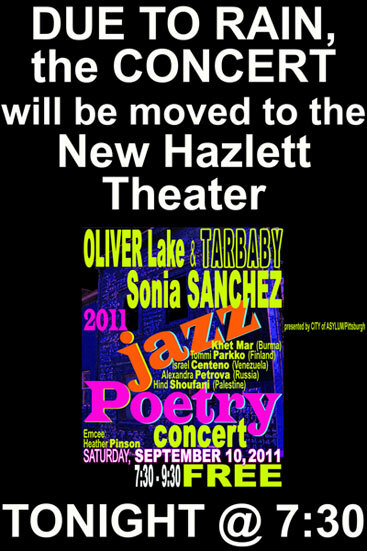 The seventeen jazz musicians comprised Oliver Lake’s Big Band and were scheduled to perform that night for City of Asylum’s annual Jazz Poetry concert. I had asked to work backstage, as I had the previous year, in order to rub shoulders with some of the most famous jazz musicians of our time. Besides, I had just recently published The Jazz Image (University Press of Mississippi), a book on jazz photography, and perhaps I had earned the right to hang with such esteemed performers. By dropping names of their predecessors and current critics, I might be able to pick their collective brain on the state of jazz today–a plaguing question for those in the modern jazz world. After all, these are musicians who are living models of success, capable of sustaining a career on their musicality alone. My confidence was wiped clean, however, upon my arrival at Pittsburgh’s New Hazlett Theater where I read a brief bio on each musician found in the concert program. 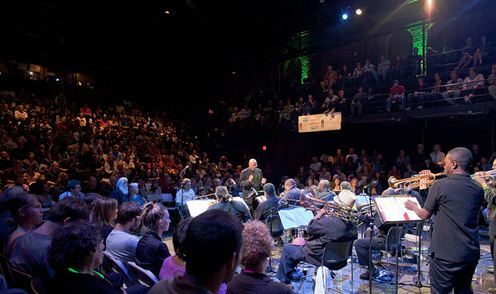 Many of the performers are full time music professors who teach at well-known universities such as Columbia, the New School, and CUNY in New York. 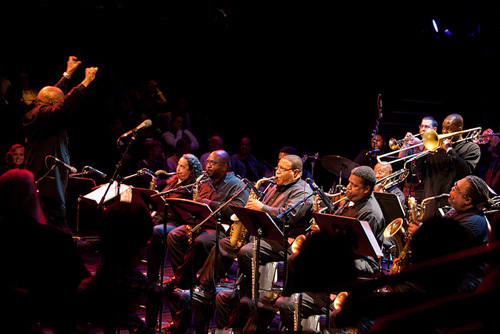 In addition, they win awards, obtain endorsements from major music labels, tour regularly–nationally and internationally–and have performed with such pop stars as Aretha Franklin, Lionel Hampton, Lenny Kravitz, Rufus Wainwright, and Queen Latifah, not to mention jazz greats like Sun Ra, Dizzy Gillespie, Mary Lou Williams, McCoy Tyner, Billy Taylor, Ornette Coleman, Clark Terry, the Count Basie Orchestra, the Mingus Big Band, the Tommy Dorsey Orchestra, and the Duke Ellington Orchestra. I felt a lump rise in my throat as I entered into the green room where the musicians dawdled around, blowing through spit valves and rustling sheet music. Some were wolfing down dinner when my abrupt speech caught them in mid-bite. Some froze open-mouthed while I barked out orders in an attempt to shroud my intimidation through attitude and sass. After my brazen announcements, the musicians perked up and began to sass back with endearing names as the “trash lady” or the “Heather Report.” Once on stage, the light and charismatic mood of the instrumentalists yielded to the serious nature of this evening’s program. At 2am that same evening, I found myself promising to visit in New York and hugged my new friends as they headed back to their hotel. We exchanged books for CDs, words for jazz licks, and laughs for deep appreciation. I am not sure when I will be able to hear the majestic grooves of Oliver Lake’s Big Band again, but I know I will remember this night for a long time. And author of The Jazz Image: Seeing Music Through Herman Leonard’s Photography.